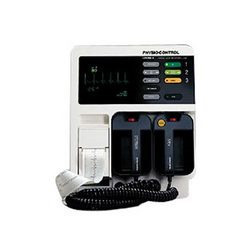 As a significant entity of this domain, we provide patrons with the superior quality of HP Code Master Defibrillator. 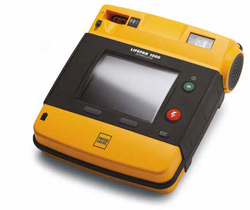 Equipped with built-in recorder, ECG and Pacing, HP code master defibrillator is fabricated by using modern machinery and technology. In addition to this, HP code master defibrillator is equipped with AC power with battery back-up. AC input: 100 to 230 VAC +/- 15%, 50/60 Hz. SYNC message appears on the monitor and is annotated periodically on the recorder while in synchronous mode. An audible beep sounds with each detected R-wave; while a marker on the monitor and sync mark on the recorder strip indicate the discharge point. Paddles: standard paddles are anterior / anterior. Adult electrodes (83 cm sq) slide off to expose pediatric electrodes (21 cm sq). Paddle cord is 10 feet (3m). Full range of internal paddles are available. Input: ECG activity may be viewed through the paddles or patient cable. Heart rate display: digital read out on monitor from 20 to 280 bpm. 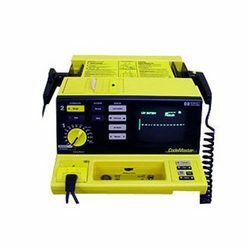 Voted as first among the best, we provide patrons with the superior quality of Medical Defibrillator Used for advanced cardiac life support in the hospitals and medical colleges, the zoll PD 2000 is precisely engineered by using modern machinery. 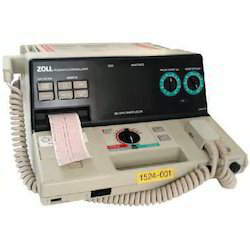 Charging time of zoll PD 2000 is less than 10 seconds, the zoll PD 2000 is damped sinusoid waveform. Display: CRT monitor displays delivered energy. AC power supply for stationary use. when used without ECG leads. Pulse Type: Rectilinear, constant current. Pulse Amplitude: Variable to 140 mA. Pacing Rate: Variable from 30 to 180 PPM. Output Protection: Fully defibrillator-protected and isolated. Pacer On: Message display on monitor. Delivered: Selectable at 2, 3, 5, 7, 10, 20, 30, 50,100, 150, 200, 300, 360 joules. Charge Time: Less than 10 seconds. displayed on monitor. Marker on monitor and on recorder paper identifies R-wave. Internal Paddles: Output limited to 50 joules when internal paddles are connected. Discharge from paddles. Charge Controls: Control on apex paddle and front panel. Paddles: Standard paddles are anterior/anterior adult and pediatric. Adult paddles slide off to expose pediatric paddles. Defibrillation Electrodes: Specifically designed ZOLL Multi- Function Electrodes used in anterior/anterior or anterior/posterior positions; packaged in pairs. of defibrillator charge and discharge without removing paddles from storage wells. Identical circuitry allows completetest of unit configured with multifunction cable. Via 3-lead ECG cable, paddles, and elec trodes. Selectable by front panel switch. Fully defibrillator-protected. 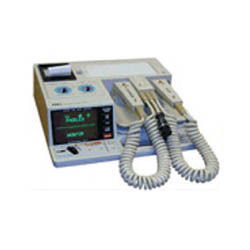 Special circuit prevents distortion of ECG by pacer pulse. .5 – 40 Hz (–3dB) standard. Monitor On: Message display on monitor. Screen Type: High-resolution CRT display. Screen Size: 5 inches diagonally (108 mm x 85 mm viewing area). Heart Rate: Digital display on monitor 0 – 300 BPM. Pacer Output Current: Digital display on monitor 0 –140 mA. ECG Lead Selection: Display on monitor. ECG Size: .5, 1, 2 cm/mV display on monitor. 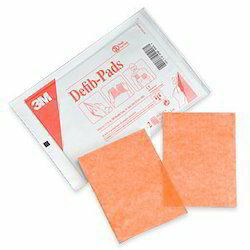 We are specialized in providing Defibrillator Pads. Years of understanding of this domain, has helped us in presenting patrons with the optimum quality of Physio Control Life Pak 9. Rich attributes such as simple 1-2-3 operation and user-friendly display, make the Physio control defibrillator highly demanded in hospitals and medical colleges. The defibrillator is equipped with auxiliary paddles for “hands-free” DE fibrillation. Auxiliary paddles for “hands-free” DE fibrillation. Diagnostics for simple test and calibration. Input: Isolated ECG via QUIK-LOOK® defibrillator paddles, F AST-P A TCH® disposable defibrillation/ ECG electrodes or 3-lead patient cable. ECG Size: Adjusts amplitude of ECG trace on monitor and strip chart recorder . Heart Rate Meter: 3 digit readout displays rates from 20 to 300bpm. controls on front panel and APEX paddle. seconds with a fully charged battery . Delay: ECG prints 8 seconds after first appearing on the monitor . Record of ECG and device parameters.